The LEGO models I create are unique models which are created without using a typical LEGO building instruction. Normally I get inspired by real life prototypes which I see in the real world or on the internet. I would say that I "know" the most common 2000 lego shapes by heard. This gives me the opportunity to start building a LEGO model just in my mind. And what started as a thought continous with bricks in my fingers. With a lot of creativity, try and error my LEGO models come to life. Yes, it is correct that LEGO fans create their own building instructions from or for their models. Basis is a CAD-model of the LEGO model. If you want to enter the wide field of virtual LEGO building and creating custom builing instructions I recommend the site www.ldraw.org as a starting point. To be successful, profound computer knowledge is necessary. Why do I not create building instructions for my models? LEGO is a hobby with limited time. To create a suitable building instruction it will take 3 or 4 times as long as "just" to build the model. I simply do not have that time. Some of my models are rather big and/or complex. My computer or at least the CAD software tools won't be able to handle such big and complex files. For me it is not very creative if LEGO is build just using building instructions. If you want to get used to certain LEGO elements a standard LEGO set will work for the beginning before you create your own models. 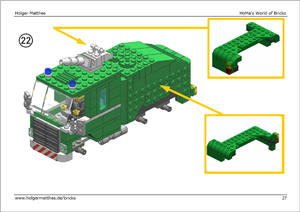 LEGO offers building instruction for official sets at their website as PDF download (http://us.service.lego.com/en-US/BuildingInstructions/default.aspx). Even if a custom building instruction would be available, the second problem would be the building material. I myself I do not trade or sell LEGO bricks. Most of my models require a lot of elements including some special elements which are not available in recent LEGO sets any more. They might be rarely available at www.bricklink.com but probably not in the required quantities. You might have to collect over a long time to get all the bricks you need to rebuild one of my models. Some folks are extremly greedy: they get hold of custom building instructions, rebuild the models and then sell them for a hell lot of money on ebay or elsewhere. Mostly in such cases the copyright holder and creater of the model (and the instructions) is neither asked nor notified. And of course he or she is not given any percentage of the gain from selling the model. Such unfair behaviour only could be avoided by not putting custom building instructions online. Where to find building instructions from other LEGO fans? The Flickr group "LEGO Instructions" collects custom created LEGO building instructions www.flickr.com/groups/lego_instructions/. On brickshelf.com some users publish their building instructions. Use the search function at www.brickshelf.com/cgi-bin/search.cgi and search for "instruction" or similar key words. A long time ago, I have created a building instruction (without part list) for my green Water Cannon Truck. This instruction is available as PDF download (ca. 3,6 MB). The PDF file is password protected, please ask for the password by email. Building instructions are available for some selected train models (steam engine BR 10 and BR 80).